It was a coincidence that on November 2, 1972, on the Feast Day of Mar Gregorios of Parumala (His Grace Geevarghis Mar Gregorios), the first Holy Qurbana was celebrated at 1800 Grand Concourse. Thus the Bronx Church was started. 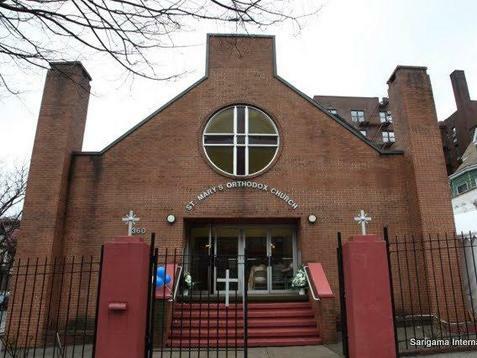 It was named St. Mary’s Orthodox Church, Bronx, New York and the Metropolitan of the outside Kerala Diocese was duly informed of all these developments. In the early stages, St. Mary’s Orthodox Church had to face strong opposition from the outside. But its acceptance by the Mother Church in 1974 by the order number 89/1974 from the Metropolitan of the outside Kerala Diocese (the late Senior Catholicos) gave it a firm footing in which the parish began to grow. By the same order, our vicar, Fr. A.K. Cherian was appointed as the first Vicar of the Bronx parish. In the mean time, the parish had also been registered with the State of New York. The need of a parish consistent with the faith and discipline of the Church was so essential at the inception, which brought families from all over the Tri-State area to the parish. By 1977, we started to think about a Church building of our own. On May 24, 1979, a plot of land at the corner of Decatur Avenue and Bedford Park Blvd. in the Bronx was bought for the Malankara Metropolitan and Catholicos of the East, represented by the Board of Trustees of the parish. The proposed visit of (the blessed memory) His Holiness Mathews I, Catholicos of the East and Malankara Metropolitan in July of that year prompted the parish to buy this plot. Their desire was to see the Catholicos lay the foundation stone for the Church however this desire did not come true. Subsequently, with the verbal permission of the Catholicos and the approval of the general body of the parish, the foundation stone was laid by our Vicar in the presence of many clergy and a large gathering of faithful on the 4th of November, 1979. It took about 18 months to complete the construction of the Church. On the 12th and 13th of September 1981, in the presence of a large gathering and dignitaries from various Church and civic organizations, the temporary consecration and dedication of the Church building was conducted by our Vicar, Fr. A.K. Cherian. Newspapers such as the New York Daily News published articles highlighting the achievement of our Indian community in a short period of time. On October 31st and November 1,1986, His Beatitude Mathews Mar Coorilos (the late Catholicos), with the assistance of His Grace Dr. Thomas Mar Makarios (then Diocesan Metropolitan), and the late His Grace Yuhanon Mar Severios (Metropolitan of Cochin Diocese) conducted the consecration of the Church in a solemn ceremony. Our parish has been the first in many areas in the Indian community within the United States. Such areas include parish membership, charity work, monetary collections for the Mother Church in India, Orthodox Theological Seminary, Mission Sunday, and spiritual works like the Martha Mariam Samajam, M.G.O.C.S.M. and Sunday School. The Martha Mariam Samajam (St. Mary’s Association), St. Mary’s Student Movement and the Sunday School program are the three main parts of the parish, conducting their work very well within their individual capacities. The Martha Mariam Samajam is the backbone of this parish. They are doing so many great things for the parish as well as for the Mother Church. Ettu-Nombu Perunal and Holy week are celebrated with great enthusiasm and in turn gives spiritual growth to those who attend it. A group of good teachers and a dedicated Headmaster, Mr. V.G. Samuel, who works very hard to make every event a success, is what makes our Sunday School program the success that it is. The Sunday school guides the youngsters to the way of God by conducting the Orthodox Vacation Bible School every summer, competitions, which help to familiarize the students with the Bible, and charity work. The newly re-established M.G.O.C.S.M. has a key role in the function of our parish. The youth take leadership roles in the parish setting and in the Diocese, which prepares them to be the leaders of the Church. The spiritual and social activities that have taken place and that are planned for the future unify the youths of our church as one body in Christ. Since the parishioners live in different parts of the Tri-State area, we started prayer groups in each Borough. Currently, our parish has 5 very active prayer groups functioning: Bronx/Yonkers, Queens/Long Island, New Jersey/Staten Island, Westchester, and Rockland. It is worth mentioning that this parish celebrates mostly all festivals according to the tradition and discipline of the Church, despite the festival falling on a weekday. This parish has always been a resourceful one. Our charity box has helped a large number of needy people in the past and still working strong in the present and God willing in the future. We distribute the charity box money according to the weight of the need. With our parish growing in number and more space a great need, it was a long planned dream to construct a building attached to the Church. After many years of trials and tribulations, once again the parish dream came true. The foundation stone for the proposed St. Gregorios Annex building was laid by His Holiness Moran Mar Baselios Mar Thoma Mathews II, Catholicos of the East and Malankara Metropolitan on Sunday, September 4, 1996 and upon receiving the permit and permission from the city, construction began. The proposed building was to add more space so that the Martha Mariam Samajam, M.G.O.C.S.M., Sunday School, and other church activities could be conducted in a better way, with more space. Unfortunately, not all people agreed, and construction was halted for another year or so. Once again, God removed the difficulties and truth prevailed as St. Gregorios Annex was completed in time to celebrate the 27th anniversary of our parish and the consecration of the building together. Previous to the consecration, on His historic visit to the United States, His Holiness Mathews II, Supreme Head of the Malankara Orthodox Syrian Church conducted Holy Qurbana in our church and blessed the St. Gregorios Annex building for the successful completion of the construction on October 10, 1998. On Saturday, November 6, 1999, His Grace Mathews Mar Barnabas conducted the consecration ceremony, in front of a large gathering of clergy, lay leaders and faithful. The history of our church would not be complete without remembering our beloved ones who temporarily have left us to be closer with our Heavenly Father. With love and prayers we remember our Church Fathers: His Holiness Moran Mar Baselios Mar Thoma Mathews I, His Holiness Moran Mar Baselios Mar Thoma Mathews II, His Grace Dr. Paulous Mar Gregorios, Rev. Fr. John Mathew, and our Church members: Rev. Dn. Thomas Schweitzer, Mr. T.M. Easo, Mrs. Amminikutty Thomas, Mr. Abraham Cherian, Mrs. Mariamma Thomas, Mr. V.P. Peter, Mr. Jacob Mathew, Mr. Binu Thomas, Mr. V.A. Alexander, Mr. Subin Thomas, Mr. A.M. Oommen and Mr. A.M. Thomas. May God rest their souls in peace.